On Tuesday night, Aug. 5, API candidate Pramila Jayapal won against four other democratic candidates in the primary election for the senate seat in Seattle’s 37th District, receiving more than 51 percent of the votes. The only Republican candidate, Rowland Martin, walked away with 11.5 percent of the votes. Six candidates ran for Sen. Adam Kline’s spot, making it the largest race in state legislature this year. API democratic candidate Louis Watanabe, received second place with 17.2 percent of the votes. Watanabe said he was happy to get second place, and that there were some good democratic candidates that were running against him. He will be running in the general election against Jayapal. 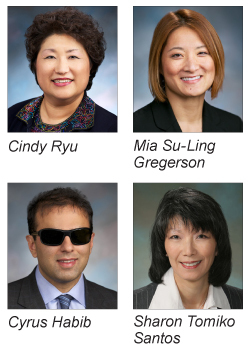 Other API candidates that fared well are Democrat Cindy Ryu, 32nd Legislative District, who received 96 percent of the vote and has no opponent. Democrat Mia Su-Ling Gregerson, 33rd Legislative District, came out with 49.5 votes against her republican opponent Jeannette Burrage who received 37 percent of the votes. Democrat Cyrus Habib, 48th Legislative District, walked away with more than 62 percent of the votes while his opponent Michelle Darnell, walked away with more than 36 percent of the votes. Democrat Sharon Tomiko Santos, Seattle’s 37th District, received more than 84 percent of the votes for the representative position. Her two Republican opponents, Daniel Bretzke and John Dickinson received 9 percent and 6 percent, respectively.